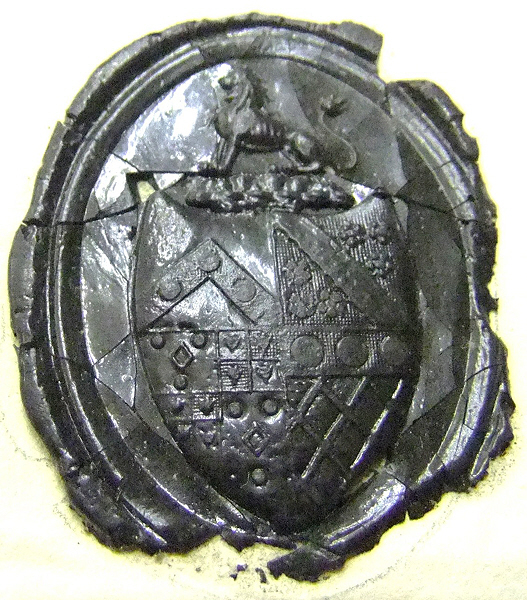 My colleague Martin Goldstraw of Whitecairns (Cheshire Heraldry) passed on a challenge to try to identify some of the components of a seal used by the Bond family of Neston. 1st Bond – Argent on a chevron Sable three bezants. 2nd Povey – Sable a bend engrailed between six cinquefoils Or. 4th de Saint Amand – Or, fretty and on a chief sable three bezants. Burke’s Extinct Baronetage shows that a Bond (of Peckham) married a Povey and a Osbaldeston of Harbens (a cadet of Osbaldston of Chadlington). The Visitation to Lancaster records that one of the quarters used by Osbaldeston of Osbaldeston was Koverdale. The Collectanea Topographica et Genealogica, Volume 4, page 368 shows St Amand ancestry for Osbaldston of Chadlington. What is not yet clear is whether or not the family of Bond of Neston are related to the Bonds of Peckham &/or if the quarters used in the seal are “heraldically lawful”.